Discussion of alternatives to Citizen’s Basic Income are increasingly debated, so we are here publishing for the first time a paper prepared in 2015 for a consultation organised by some of the UK’s major charities on options for reforming the benefits system. This short article outlines three options for the reform of the UK’s tax and benefits system: Tax Credits, Negative Income Tax, and Citizen’s Basic Income. The descriptions and discussions assume that both the tax unit and the benefit unit are the individual and not the household. The complexities related to household-based options would require additional description and discussion. In the diagram, the credit is worth £x per week. As earnings rise, the credit is withdrawn, so net income rises slower than earned income. At earnings of £y per week (the break-even point), the credit has all been withdrawn. Above this point, Income Tax is paid. The diagram assumes that the rate at which the credit is withdrawn is the same as the tax rate. 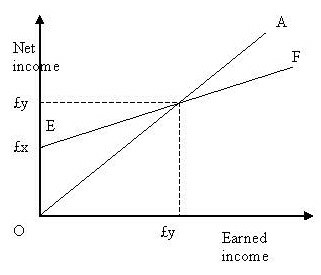 If the rates are different then the slope of line EF is different above and below earnings of £y per week. The tax credit can be administered by the Government or by the employer. If the Government administers the Tax Credit, then the employer must provide regular and accurate earnings information to the Government, as with the current Universal Credit. If the employer administers the Tax Credit then, if someone moves between employers, their Tax Credit administration has to be transferred between employers. If they have a period of unemployment, then administration of the Tax Credit has to be handed to the Government and then on to the new employer. If someone has two employments, then the employers have to decide which of them will administer the Tax Credit. And if someone has occasional other earnings, then their employer needs to be informed so that the Tax Credit can be withdrawn accordingly. If every working age adult receives the same Tax Credit then neither their employer nor the Government needs to know any personal details. If people in different circumstances receive different levels of Tax Credit then their employer and the Government will need to know individuals’ circumstances in order to allocate the correct credit. Our current income tax system is cumulative. An annual amount of income is not taxed. Each week, or each month, the employer has to calculate how much tax to deduct so that, by the end of the year, the correct amount of tax has been deducted. With Tax Credits, the tax system would be non-cumulative. Each week, or each month, the correct amount of the Credit would need to be paid in addition to earnings, or no Credit would be paid and earnings would be taxed. A non-cumulative system requires a single tax rate, so anyone paying higher rate tax would need to pay additional Income Tax at the end of the tax year. Income Tax deducts money from earnings above an earnings threshold, and a Negative Income Tax pays money to the employee below the threshold: so a Negative Income Tax scheme functions in the same way as a Tax Credit scheme. The only difference is in the specification. A Tax Credit scheme specifies the amount to be paid out when there are no earnings, along with a withdrawal rate as earnings rise. For a Negative Income Tax, the threshold is specified along with tax rates above and below the threshold. If the rates above and below the threshold are the same, then for earnings below the threshold, the same amount is paid out for earnings of £z below the threshold as would be collected in tax on earnings of £z above the threshold. As the system is essentially the same as a Tax Credit scheme, the same diagram applies. Different rates above and below the threshold would result in the EF having different slopes above and below earnings of £y per week. Administrative considerations would be the same as for Tax Credits. A Citizen’s Basic Income is an unconditional income paid to every individual by the Government, and it is not withdrawn as earnings rise. Tax is paid on all or most earned income. In the diagram, a Citizen’s Basic Income of £x per week is paid to everyone. All earnings are taxed. 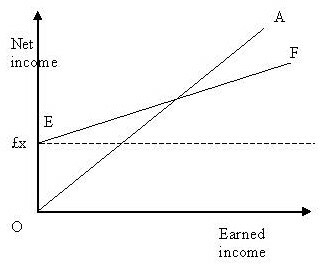 The line EF shows the net income. The Government pays a Citizen’s Basic Income to every individual, the amount depending only on the person’s age ( – larger amounts could be paid to older people as a Citizen’s Pension, and lower amounts to children and young people). Employers would continue to administer Income Tax via PAYE as they do now. Negative Income Tax, Tax Credits, and Citizen’s Basic Income, all generate the same net income diagram, so all three schemes would reduce marginal deduction rates (the total rate of withdrawal of additional income), would incentivize employment, and would enable families more easily to earn their way out of poverty. The differences between the schemes are administrative.